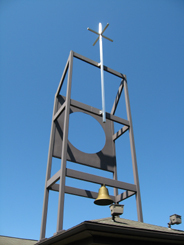 The St. Paul’s Lutheran church, located on Hamilton Blvd. and Weiler’s Road, was built in 1986. 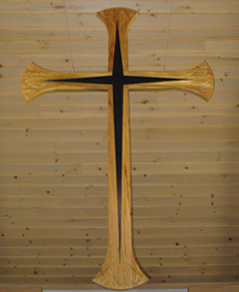 The chancel design is in an art deco style, and the mediums employed are black, brushed aluminum, and teak wood. Teak was chosen because it resembles the biblical olive wood. The chancel was designed to be flexible, to suit the liturgical emphases of the season. 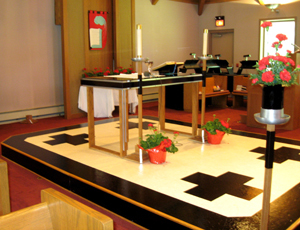 The chancel floor holds four black Greek crosses on white background, and is an adaptation of the art deco marble checkerboard pattern. The communion table/altar with its black block mensa on teak legs, is to be left unadorned except for a white corporal when the sacramental vessels are placed upon it. dwells among us now in Holy Spirit (dove). In addition, the above etchings represent God’s story – his coming in Word, flesh and Spirit. In addition, the above etchings represent our story – receiving him in baptism, Holy communion, and through the Church. While the nave will seat 300, the narthex adds an additional capacity of 75. The narthex was made large to accommodate fellowship before and after worship. The fellowship hall will seat 150 at tables, and be divisible into six classrooms for Christian education. Accessibility for a future larger fellowship hall is provided. One wall of the full kitchen is made for banner and communion vessel storage. The north wing, in addition to mechanical, janitorial, and restrooms, includes a larger nursery room with changing-table/sink and access into the women’s restroom. In addition, there are three permanent classrooms, with one of them doubling as the choir room, and two adjoining offices. The Cross-Tower clears the air for all who see the building. The canopy also allows for wet-weather curb service. Wall Candle Sconces – During the Advent season of 2007, we decided to replace our well worn pew candles with wall sconces. 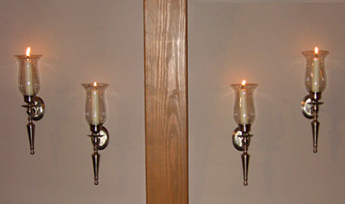 With the help of congregational donations, sixty beautiful wall sconces were purchased and installed, and used for the first time for the Christmas Eve candlelight service. In November 2014, we replaced our old sign with a new LED sign. This sign works off a computer in the church, giving us the ability to update it without worrying about climbing over snow banks, or finding two people to handle the old sign. We have had many positive comments about the sign, not only from our own members, but from people in the community. 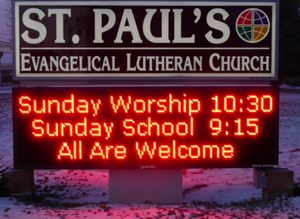 We hope this sign and its invitation and information will let others know they are always welcome at St. Paul’s. In January 2008, a new sign was installed along Weiler’s Road for better identification. 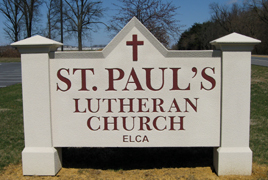 In fall 2012, St. Paul’s built a new pavilion on the northwestern part of the church property. 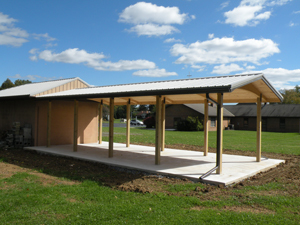 Plans are underway to use the pavilion for picnics, concerts, outdoor worship, etc. Linked together with the pavilion project was the reinvention of the side entrance of the church building. The step has been taken away and a ramp is in its place, allowing improved accessibility.